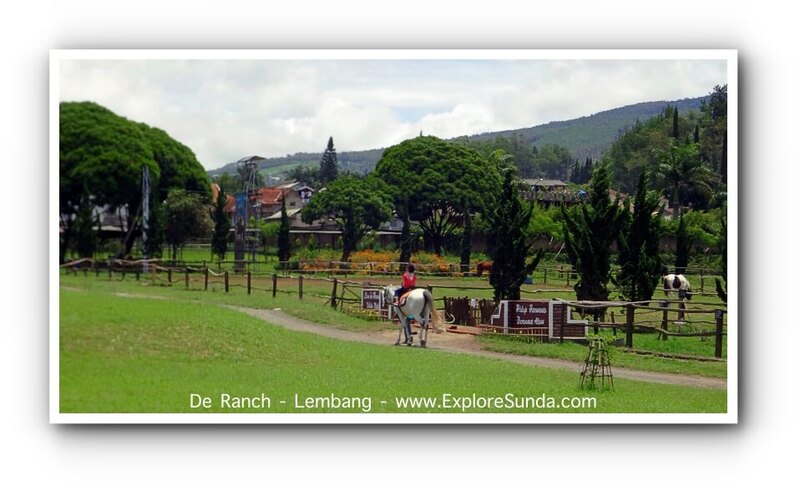 Lembang has several places for horse riding. One of them is De Ranch. I like it here because its horses are the big tall ones, almost like the ones in cavalry. The horses are tame enough even for us who never ride before. They are definitely bigger than the horses used for horse riding in Bandung. If these horses are too big for young children, they can choose the ponies. Once we have paid the ticket for the ride (Rp. 25,000 per person per ride), we may borrow a cowboy hat and vest to wear during the ride. All set, then we are ready to ride a horse around the pasture. This place has a huge field, in the center there are two fenced fields for horses grassing around. Looking at the mountains in the background, this spot is really picturesque. Our ride starts from the ticket booth where the horses are lined up ready for a ride. Although all of these horses are tame, every horse has its own keeper, who will walk beside it to accompany every guest during the ride. Hence, we don’t need to worry to fall off the horse, even though we never ride a horse before. Usually, the horse only walks and the reign is held by the keeper. However, if we are confident enough, the keeper will let us handle the horse by ourselves. Of course, he will still accompany us throughout the ride. 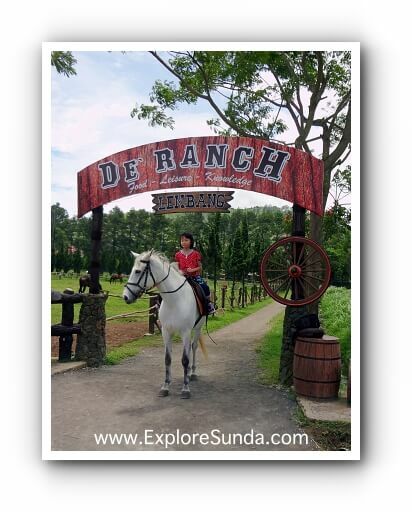 Although the main attraction is the horse ride, De Ranch has several other games and rides. Some of them are trampoline, cycling, horse-cart ride, paddling in a pond, fishing for young children, flying fox, and archery. So everyone can play and enjoy being here. Once we arrive, we have to buy the entrance ticket (Rp. 8,000/person). Inside the hall, we can exchange this ticket: one ticket with a cup of fresh milk or two tickets for a cup of yoghurt. Then we must buy tickets for each ride we go. The ticket price varies according to the game or ride we choose. For example, a ticket for one horse ride is Rp. 25,000. There is not any one day pass ticket available. If you take many rides, you most likely will spend hours at De Ranch. Whenever you are tired playing, there are many food stalls you can choose. The layout looks like a food court with a big hall with lots of tables and chairs in the middle. Even it has two halls, where one has a stage for live performance. However, in my opinion, the food offered are more snack types and the tastes are just average. It is easy to find it. 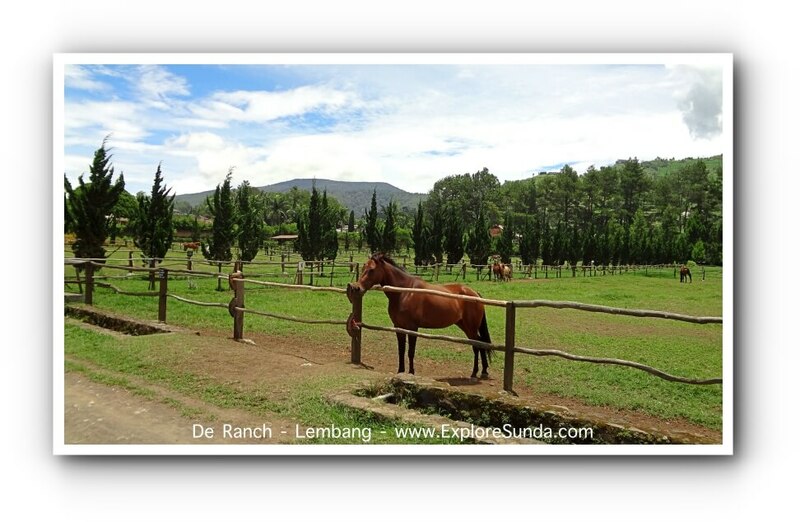 It is just outside the downtown of Lembang, in the direction to Maribaya park and waterfall. Although most visitors come with private vehicles (cars and motorcycles), we can go there using public transportation too. 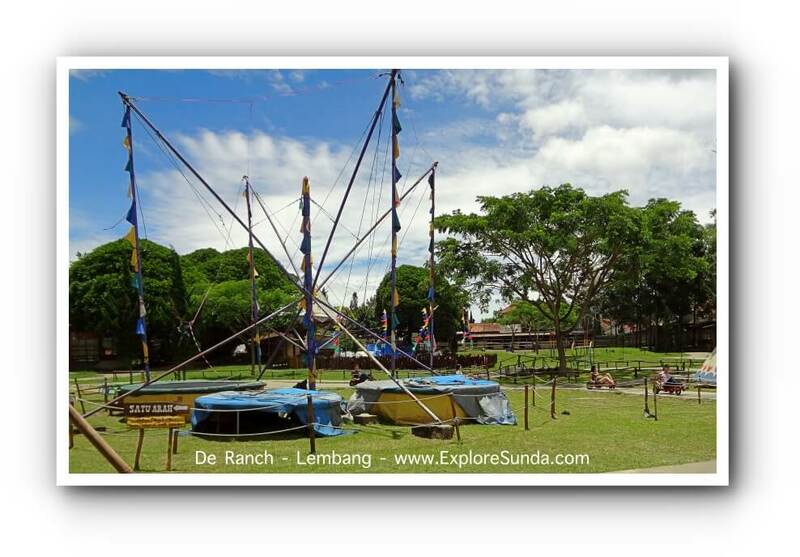 There is public transportation between Bandung and Lembang that will stop at Lembang market. From there we only need to take a short walk.